For some commuters, the morning jaunt on public transit is a bit more hip due to a growing affinity for unusually cool bus stops. But riding the bus in Krumbach, Austria, is like taking part in an architectural post-grad program. Residents of Krumbach, a community of around 1,000 people in the Austrian state of Vorarlberg decided their community needed a public transit facelift, so they teamed up with seven architects from seven different countries, including Russia, Norway, Belgium, Spain, Chile, China and Japan, to design seven unique takes on the Buswartehüsle, or bus shelter. The fee for this architectural contract work? An all-expenses-paid holiday in the beautiful Krumbach area for each designer. 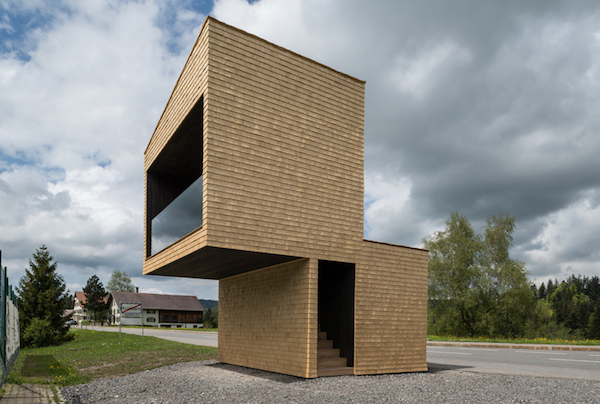 Check out the seven incredible Krumbach bus shelters in the gallery courtesy of project photographer Yuri Palman and get that petition ready to start a bus stop project in your neck of the woods. Perhaps because the purgatory of waiting for the bus is one of the most aggravating daily trials of urban life, I love a clever bus stop design. This summer, people waiting for the bus on South East Avenue in the Highlandtown neighborhood of Baltimore were treated to a public art sculpture that its designers, Madrid-based artist collective Mmmm, call “an obvious bus stop.” So patently obvious and instantly appealing that it makes you wonder why the world isn’t full of 14-foot-tall, 7-foot-wide three-letter bus stop typography sculptures that spell out the word BUS. The sculpture is made from wood and steel, conceived like oversize pieces of urban furniture. Each letter is big enough to accommodate two to four people. The B can protect them from the elements, and the curve of the S invites passengers to lie back while they wait. 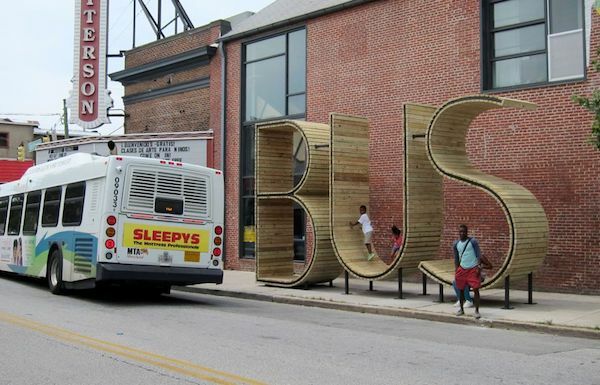 Alarcón told me that the designers wanted “to create a very friendly bus stop to contrast with the industrial city” of Baltimore and help revitalize the Highlandtown neighborhood. Like the Mmmm’s first public sculpture, the popular Meeting Bowls in New York City’s Times Square in 2011, the bus stop is the kind of playful design that encourages people to relax and interact. 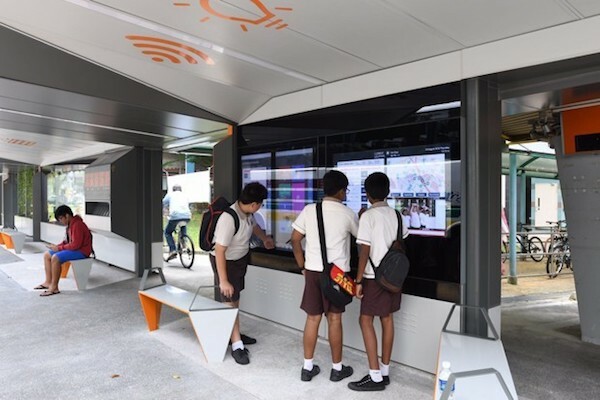 While Alarcón said that the bus stop is site-specific and they haven't been commissioned to build more, its design is so universally appealing that it could work virtually anywhere. The bus stop is built like a conventional street bench, with wood planks screwed to a steel structure that supports weight and prevents vandalism. Refreshingly, nowhere in the bus stop concept does there appear to be the kind of defensive architecture that is designed to keep people from loitering in a way that makes everyone less comfortable. 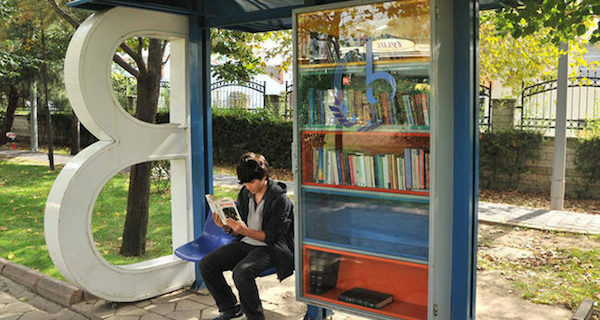 The Municipality of Bağcılar, Istanbul's most populated district, is offering a novel service for commuters: bus stop libraries. Bookcases placed in bus stops will have a wide selection of books for those looking to spend their leisure time while waiting for the bus. Initially set up in 11 bus stops, the municipality plans to install libraries in others soon. A total of 20,000 books were placed in small libraries since September when they were first introduced and they are being changed with new titles twice a week. Commuters can either read the books at the seated bus stop or borrow it and read it somewhere else. They can return the books to another bookcase at another bus stop. Speaking to A Haber, Bağcılar deputy mayor Mehmet Şirin said Istanbul's congested traffic made waiting times for buses longer and people sought things to do to kill time. "People always find excuses not to read books and the first excuse is usually that they don't have free time. This library is an answer to this excuse," he said. Şirin said that they were pleased with the positive feedback for the libraries. He said that bookcases in bus stop libraries are never left empty and they replaced the borrowed books with new ones every day. Şirin said that adults, young adults and children can find a title to their taste in the libraries. "Our municipality has a library and we chose titles for the bus stop library among titles in demand in the municipality library. Though the libraries are managed by the municipality, it is clearly inspired by a similar project in Israel's Haifa. A group of artists had installed bookcases in bus stops there in 2010. Libraries were quickly embraced by commuters who started donating books themselves. Groovy! 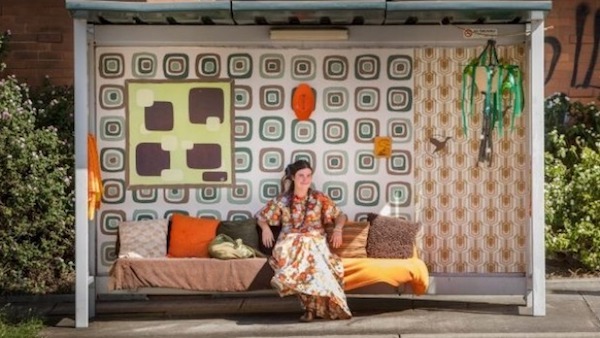 In 2017, Valentine's Day commuters using a stop on the 546 bus route in Melbourne, Australia, were surprised to find it transformed into a 1970s living room. The stop was fitted out with an orange and brown cushioned "couch," a curtained window, and retro wallpaper adorned with kitsch artwork and a pot plant. Artists Jill and Suse (known only by their first names) "reclaimed the space" using only secondhand and recycled materials. Jill, who was the lead artist in the project, turned the stop into a 1950s lounge room in January 2016. One of the perennial complaints from transit riders in South Florida is that they have to wait for buses under the blazing sun or in the rain. The first air-conditioned bus shelter in the region was formally opened in a ribbon-cutting ceremony in Hialeah. Miami-Dade County and Hialeah officials gathered last Wednesday to formally open the air-conditioned bus shelter at the Hialeah Metrorail station. The structure has a sliding door and contains a row of seats inside. The enclosed air-conditioned shelter has room for four people seated, and 11 standing. 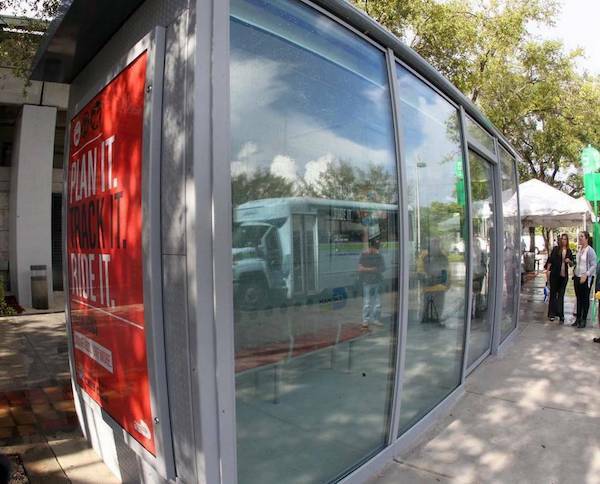 It’s part of a pilot program that eventually could lead to the installation of more air-conditioned bus shelters in Miami-Dade. The Hialeah facility might well be the first in the United States. What is more common in the U.S. are heated bus stops in the Northeast and Midwest. Air-conditioned bus stops have proliferated in some desert locations in the Middle East such as Dubai. “I read an article that up north they have heated shelters for buses, and then we found another where in Dubai they had an air-conditioned bus shelter and we said well, let’s try it out, that’s something that we know people want,” said Alice Bravo, the director of Miami-Dade County’s department of transportation and public works. “We need to test the AC shelter out, so we installed this one shelter as a pilot program,” Bravo said. It was built at a cost of $65,000, she added. Bravo, along with County Commissioner Rebeca Sosa, whose district includes Hialeah, participated in the ceremony, as did Miami-Dade Mayor Carlos Gimenez and Hialeah Mayor Carlos Hernández. Gimenez invited Ana Barquero, a Nicaragua-born bus rider in Hialeah, to participate in the ribbon-cutting ceremony as well. Barquero, 77, was one of the first passengers to use the air-conditioned bus shelter. At the ceremony, Gimenez said the goal is to make public transportation more attractive. Bravo said another incentive to draw passengers to transit is an upgraded version of the Miami-Dade Transit Tracker application. Bravo said the application also has a trip planning feature with bus and trolley routes. In another move to draw transit riders, Bravo said that during August and September her office will give away weekly transit passes that are good for Metrorail and Metrobus travel. 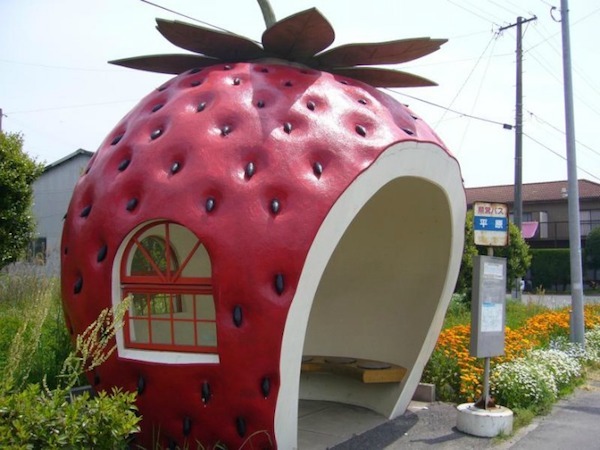 Japan is known for its imaginative design, and now they've even taken boring bus stops and re-invented them as gigantic fairy tale fruits! Inspired by the pumpkin carriage from Cinderella, these juicy shelters are shaped like watermelons, strawberries, tomatoes, and oranges. Who knew sitting and waiting for the bus to come could be so much fun? You wait all day for a bus to come along - then a toilet, sink and loo-roll holder turn up instead. 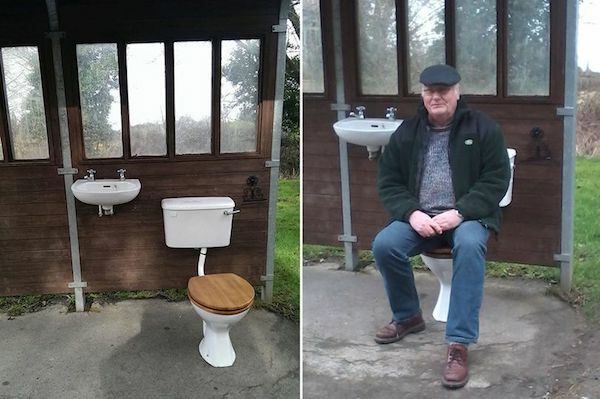 That's what happened when pranksters in a Surrey village took the phrase ‘public convenience’ to new levelsm and installed the bathroom fittings in a bus stop overnight. The origin of the bizarre addition is unknown, but the bog-standard prank was described as "hysterical" by a parish council clerk. But despite joke, the "fun police" have since taken been and taken the quirky installation away. Parish council clerk Gaynor White, told Get Surrey she "couldn't believe it" when she heard about the toilet's appearance overnight. The Worplesdon Parish Council Clerk continued: “I received a phone call just before midday and the groundsman said ‘you will never guess what I have found’. “I have been the parish clerk for 15 and a half years, and I have never seen anything like it - it is hysterical really. “The key question is - should this be considered a bus shelter improvement or simply money down the drain? Worplesdon Parish Council is responsible for looking after many of the bus shelters in the village. During the past year, Mrs White said that a spate of vandalism has been occurring to the stops. She said: “In October 2014 there was road accident in Rydes Hill. Mrs White also mentioned another incident where she believes a ball bearing catapult was used to damaged the glass of a shelter in Woking Road. The clerk said a bus stop in Jacobs Well Road was also attacked by vandals, adding to the growing total Worplesdon Parish Council spend on bus shelters. Commenting on whether these incidents could be linked to the most recent bus stop addition, Mrs White mentioned that she thinks there are new pranksters on the scene. The toilet, sink and loo-holder, which was actually used - despite not being plumbed in - has now been removed. “It took quite a lot of effort to fix this, as it was actually screwed to the shelter - it wasn’t just dumped there," Mrs White said. “I just don’t know why someone has chosen to do this. “I personally took them to the municipal waste site in Slyfield to be recycled. “The fun police have been to take the fun away, you could say." 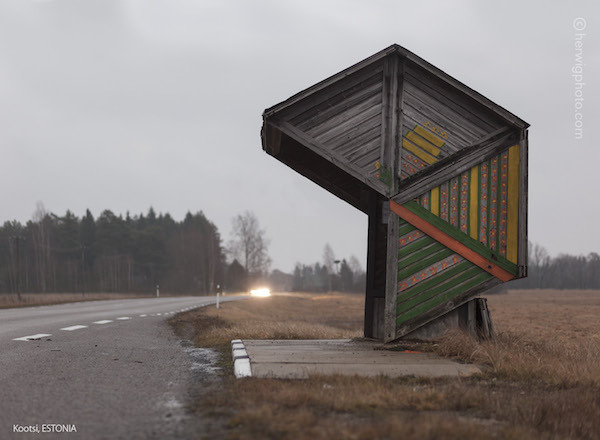 0 Response to "9 Coolest Bus Stops In The World"